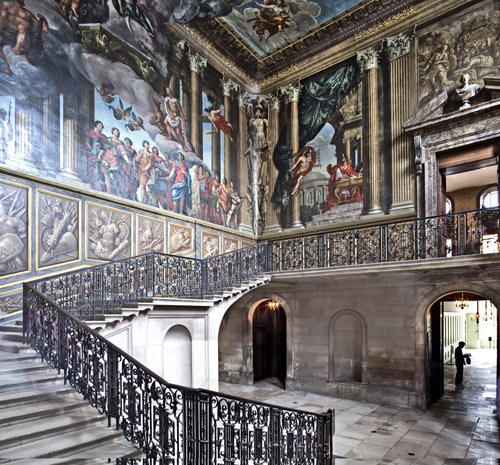 The balustrade to the King’s Staircase at Hampton Court Palace was designed and made by the Huguenot ironsmith Jean Tijou. Tijou seems to have arrived in England with William III and Mary II and was active here from about 1688-1712. His most notable work at the Palace was the screen composed of twelve panels, which now bears his name, and can be seen, where it was installed in 1701, at the river end of the Privy Garden. It seems likely that it was at about this time that Antonio Verrio2 painted the walls of the King’s Staircase. In the scheme (see above) Verrio showed William III in triumphal mode, dominating a group of Roman emperors who represent the King’s Catholic enemies, as well as a banquet of the Gods denoting the peace and plenty William had brought. However, as with all the work that I have undertaken for Historic Royal Palaces I was provided with a comprehensive folder containing all that was known about the project. Even before starting the examination I had something to work from. I felt that by comparing the documentary information with any fragmentary evidence that I might find I would be able to draw some useful conclusions. This suggests that the balustrade was in place but that other works were being carried out in the area and that the initial scheme of decoration would be applied when this was finished. Presumably it was at this time that Verrio was painting the walls. 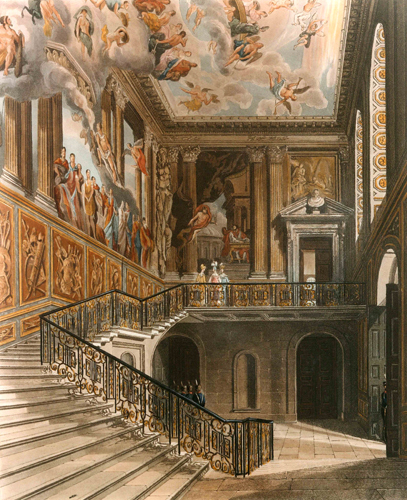 The earliest known illustration of the King’s Staircase that provides useful information is this one of 1819 in William Pyne’s The History of the Royal Residences (1816–1819) which quite clearly shows a distinct pattern of gilding on the balustrade. Even before the first samples were taken it was apparent that the balustrade had been gilded, but there was no information on the colour of the paint. Analysis provided a certain amount of information, however the evidence for the first scheme was not as clear as one would have hoped for and certainly not as helpful as the Queen’s Staircase. 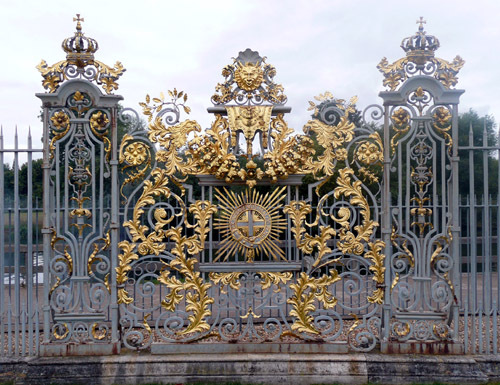 The sample above was taken from an element that was gilded originally. Beneath the very thin layer of gold leaf can be seen a semi-translucent greenish gold size, which was used to adhere the gold. 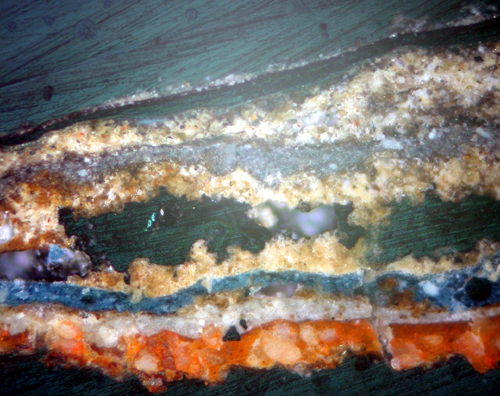 Underneath that to the right-hand side of the off-white layer can be seen two glass-like particles. 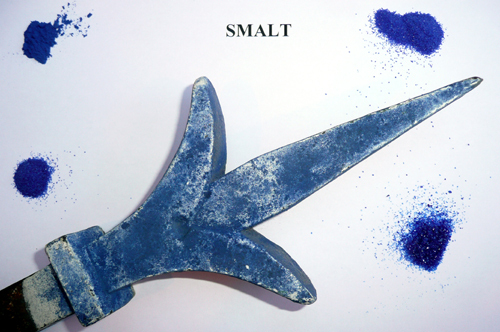 This is smalt that has lost its blue colour. 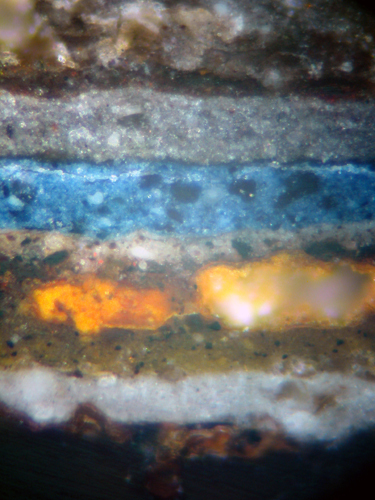 It can be seen that the original scheme of blue (smalt) and gold survived for at least twenty years because the second scheme is a very distinctive blue colour applied over a dark grey undercoat. On this occasion the blue was produced using the new pigment Prussian blue. 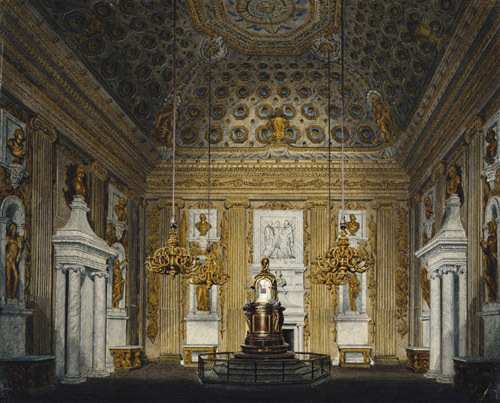 This is an important point because one of the earliest indications of its use in decoration was in 1722 in the Cupola Room (see below) at Kensington Palace.9 Prussian blue is unlikely to have been applied before this. This suggests that the first scheme must have remained for at least twenty years. It seems highly possible that it was carried out using a smalt with a high-potassium content and that the colour leached out during that time. As with so many of my projects the decision as to which scheme to choose for redecoration (should that even be considered) is not immediately clear. It seems likely that the smalt scheme had been replaced by Prussian blue by the 1720s. Prussian blue itself might be an option, but what about later schemes? There again, the balustrade has been stripped for nearly a century, perhaps it is best to leave things as they are. Fortunately all I can do is to provide the information and then take part in subsequent discussions – others make the final decisions. Kensington Palace: The Cupola Room. Richard Cattermole. ca.1817. Made for William Henry Pyne’s ‘History of the Royal Residences’. 1 It has been remarked that the balustrade to the King’s Staircase does not sit as well as it might do on the treads. It is thought that they were adjusted very early on and the steps made more shallow as King William was prone to asthmatic attacks and found the original configuration too steep. 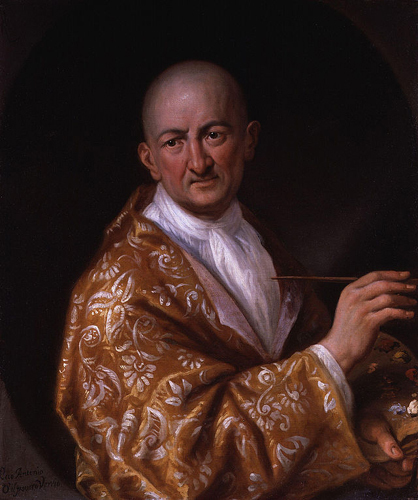 2 Antonio Verrio ca.1636-1707. Trained in Italy, Verrio painted grand scenes for ceilings and staircases in many country houses and in royal palaces for Charles II and for William III. 4 Thomas Highmore (?-1720) was appointed Serjeant-Painter to King William III, and retained the Post under Queen Anne and King George I. He succeeded Robert Streater. Very little is known about Highmore apart from the fact that he painted the panels between the windows in the Chapel Royal. He resigned a few months before his death, and was succeeded by his apprentice and assistant, James Thornhill. He was uncle of the painter Joseph Highmore. 6 A Description of England and Wales, vol vi. 1764. 7 Until the second half of the twentieth century the main constituent of most architectural paints was lead carbonate, a white compound derived from metallic lead. 9 William Kent was commissioned to paint designs on the ceiling using the more expensive ultramarine pigment. However, he was later accused of having employed Prussian blue instead, whilst charging for ultramarine (History of the King’s Works (ed. H.M. Colvin 1963-82). Vol. V 1660-1782. HMSO. 1976.) 198-9).